Take the TGV train from Gare du Lyon to Avignon(2.5 hours). Or a direct flight to Marseille. If you are arriving at Charles de Gaulle and wish to avoid Paris, there is a train station there in Terminal 2. Once you arrive in Avignon or Marseille, pick up your rental car -- we recommend small to midsize to help navigate streets and minimize expensive fuel costs. Pack casual and lightly, especially if you are taking trains which can be a hassle with large luggage. Provence is a very casual place -- leave the coat and tie at home unless you're planning fancy restaurants or a trip up to Paris. Be sure to bring a jacket and sweater for layering, plus a raincoat. Provence has a Mediterranean climate, warm from mid-April to mid-September and often into October. It can be warm as early as February or as late as November, yet we once wore sweaters to a July Bastille celebration -- the famed Mistral wind can be fierce. There is also rain in all seasons, but it is usually sunny in Provence. We recommend purchasing and studying a few of our favorite guides before your trip: Michelin Green Guide to Provence, Michelin Map #527, and Fodor's Provence. 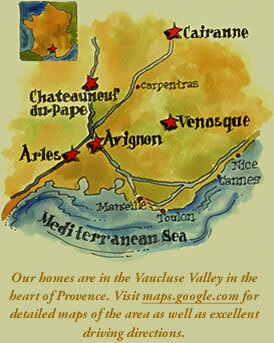 The website, ProvenceWeb, is also filled with useful information. Biensûr! Brush up on your French, but don't worry if you aren't fluent as villager will normally respond to pointing, hand gestures and smiles. Do be sure to start every interaction with "Bonjour" (hello) and end with "Merci" as the French consider these essential to all interactions. There are countless language books on Amazon and apps available for your phone. For those in Portland, check out the small classes at French Community of Portland or Alliance Française; the latter has offices in many American cities. To get inspired, check out Patricia Well's At Home in Provence. Robert Parker's Wine of the Rhône Valley is the definitive guide from Marseille in the south to Côte Rôtie in the north. His extraordinary palate and knowledge of the area offer a reliable roadmap to hundreds of wines and wineries. His website has more current updates.